To apply for a Scholarship, download our application form which is also available from the Admissions Office: 020 8959 1221 or email registrations@millhill.org.uk. The current arrangement of separate scholarship examinations will be discontinued. Instead, the Head of an applicant’s prep school will be asked to make the recommendation for consideration for an academic award and the format of the prep school Head’s reference will be modified to allow more space to identify particular academic strengths, especially where these are in subjects not in the entrance examinations. Those candidates whose performance in the entrance examinations is sufficiently strong, as assessed by the School, will be invited to proceed to a series of scholarship interviews, held at the end of the second week after the entrance examinations. Those going forward for scholarship interview may include those recommended by their prep school head and also any others who have met the required standard of performance in the entrance examinations. Candidates will be interviewed by Heads of Department at Mill Hill in 1, 2 or 4 of the subjects offered in the entrance examinations (depending on their performance), and by the Headmaster. The subject interviews will be 20 minutes long, with candidates given some material/questions to prepare for 20 minutes before each interview. The interviews will have agreed criteria for evaluation. Academic Scholarship for strong performance in all/most scholarship interviews Academic Exhibition for good performance in all scholarship interviews Exhibition in one or two named subject(s) for strong performance in the relevant subject interviews and in the Headmaster’s interview. The School will continue to offer awards in Art, Drama, Music and Sport; the assessments process for these will not change, though candidates may be screened on application to decide whether they are sufficiently competitive to proceed to the practical assessments. English: One comprehension exercise and one essay. Mathematics: Questions on a wide range of topics normally covered in the Common Entrance syllabus. Science: Questions on each of Biology, Chemistry and Physics. French: Tests in listening, reading, speaking and writing. Latin: There will be one paper for candidates following the Cambridge Latin course and an alternative paper for those following a traditional Latin course. Candidates should inform the School which paper they intend to sit. 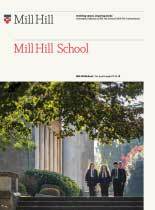 Specimen papers may be obtained from the Admissions Office on 020 8959 1221 or email registrations@millhill.org.uk. Ward Art & Design and Design Technology Awards may be made annually. Candidates will be required to submit a portfolio of recent work. Candidates for an Art and Design Award who do not wish to sit the Academic Scholarship Examinations should nevertheless expect to perform at a sound level in the School’s Entrance Examinations. A number of Sports Awards may be made annually. Candidates will be required to provide evidence of their sporting ability by the presentation of a sporting CV and a letter of recommendation from their present school and/or a letter of recommendation from a coach or manager of any out of school team represented. The letter of recommendation should detail significant skills and achievement of the candidates in their chosen sport/s. Candidates for Sports Awards must also perform at a satisfactory level in the School’s Entrance Examination or in the exam leading to the award of Academic Scholarships. Candidates will also be expected to attend a Sports Award Trial in January, where fitness and agility levels will be assessed in their chosen sports. Music Scholarships and Exhibitions may be awarded annually. Candidates may enter for either an Academic Award or a Music Award or for both. Candidates for a Music Award who do not wish to sit the Academic Scholarship Examinations should nevertheless expect to perform at a sound level in the School’s Entrance Examinations. The Major Music Award is named the Helmore Music Scholarship. At Fourth Form level, candidates for a Music Scholarship will normally be expected to have reached at least the standard (though not necessarily to have sat the examination) of Grade 6 in piano or Grade 5 in an orchestral instrument. For a Music Exhibition one grade lower would be expected. Candidates may also offer a second instrument at a lower level, and/or voice, and/or composition. Two contrasting pieces will be expected and there will also be aural and sight-reading tests. Musical ability may also be taken into account in making other academic awards. Further information on Music Awards may be obtained from the Director of Musical Performance. The student should have an outstanding record of full participation in past school productions, supported by a reference from that school, outlining exactly what the student has achieved in the past and why the student should be considered for such an award. The candidate will take part in an audition session at Mill Hill in January. He/she should prepare two short audition speeches, one from Shakespeare and one from a modern play. These should be fully rehearsed before the audition, word perfect and show outstanding ability in both voice and movement work. The student will take part in a drama workshop with other candidates on the day of the audition, where he/she will demonstrate a confident awareness of how to work positively and creatively with others in such an environment. Candidates should only attempt this audition if they have a proven interest in drama and something very special to offer the school. The successful candidate will be expected to involve him/herself in public performances as requested at the school during their time at the school. There are a number of awards funded by external Trust Funds; the Headmaster nominates candidates for these on the basis of the School’s normal interviews and Entrance Examinations and the reference from the Head of the candidate’s present school. Means-tested bursaries are available to new entrants to the School. Such awards are intended to extend the benefits of a Mill Hill education to pupils whose families would not otherwise be able to afford the School’s fees. In addition, the School makes provision for the award of hardship bursaries to assist families who experience sudden and unexpected hardship. Bursaries are funded from the School’s fee income, supplemented by contributions to the Mill Hill School Foundation Appeal. Bursary awards are made by the Court of Governors upon the recommendation of the Foundation Bursary Committee.